For me, this is a bittersweet story. Back in 2008 my colleague Rob Stevenson and I wrote an editorial for the Canadian Medical Association Journal calling for the reform of hospital cafeteria food. It was met with a great deal of word of mouth support, but very little in the way of feet on the ground (except Quebec whose Health Minister Yves Bolduc quickly banned the use of deep fryers in hospitals). Perhaps with the gentle encouragement of Rob (he's much nicer than me), Nova Scotia's Capital Health hospitals followed suit, and in September 2009, they also banned deep fryers. With both of us being quite busy, I don't hear from Rob too often, but just last Friday he sent me a copy of a memo penned by Nova Scotia's Capital Health hospital's vice president of sustainability. The memo explained Capital Health's next move, one that will see Tim Horton's (a Canadian donut/coffee icon), forbidden from selling donuts and muffins that don't meet Capital Health's healthy food guidelines. "One way Capital Health is working to improve the health of our community is by making healthier choices the easier ones in the food we sell to the staff, patients, families and visitors that use the restaurants in our facilities day in and day out." Indeed! Hospitals should not be profiting off the sale of unhealthy foods and instead should serve as role models for their communities. 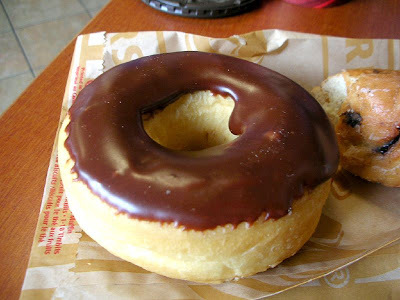 So what's going to be left on Tim Horton's Capital Health shelves? "baked goods such as doughnuts and those muffins that do not meet Capital Health’s healthy food guidelines will no longer be sold"
certainly suggests that some muffins will meet their guidelines. Of course their guidelines will be based on Canada's Food Guide, and therein lies the rub. According to a CTV article on this story, Capital Health hospital Tim Horton's will still be selling their low-fat berry muffin. Low-fat of course, is pretty much the focus of Canada's entire Food Guide. Problem is, evidence-based nutrition would suggest that with rare exceptions, single nutrients are difficult to truly link to disease and that rather patterns of eating are more important. Using a guideline that falsely elevates the reduction of fat to the pinnacle of dietary discretion means that so long as a food's fat levels are low, the rest doesn't matter. So let's look at Tim Horton's low-fat berry muffin. Compared with a soon-to-be-banned chocolate donut it's made with the same highly refined carbohydrates, packs nearly 30% more calories, 150% more sodium, equivalent amounts of trans-fat, and a whopping 5 teaspoons more added sugar. So at the end of the day, while this is a real, formative and praise-worthy step forward for Nova Scotia's Capital Health and hospital food reform, until we see our government step up with actual evidence-based dietary guidelines, these forward thinking efforts, may still ultimately end up being nutritionally backwards.